Sébastien Squillaci played his first Ligue 1 match with OL last Sunday against Nantes. 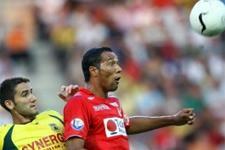 A 3-1 victory, and his 11th goal in the French championship. In 2002-2003 : Monaco 3 Sedan 0 (1 goal) and Monaco 1 Lens 1. In 2003-2004 : Monaco 1 Metz 0, Monaco 1 PSG 1, Monaco 4 Le Mans 1, OM 1 Monaco 2 and PSG 2 Monaco 4. In 2004-2005 : Monaco 2 Lille 0 and Bordeaux 1 Monaco 1. 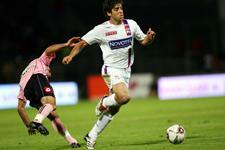 He also scored at Gerland stadium, but put the ball in his own net when OL beat Monaco 3-1 (2003-2004). Having had Givet, Rodriguez, and Modesto as his partners in Monaco’s central defense … he was linked for the first time in L1 with Claudio Cacapa. Supplanted by Rémy Vercoutre during the Champions League and against Nantes for the season’s opening game, Gregory Coupet got back into the swing of things after three months, give or take a day, out of the action.